The first event of the 2017 World Series of Poker Europe has come to an end. Oleksandr Shcherbak, from Kiev, Ukraine, took down Event #1: €1,100 No-Limit Hold'em MONSTER STACK for a nice payday of €117,708. Shcherbak put on a dominating performance when he got heads-up with Viliyan Petleshkov. He raced out to lead with some strong aggressive play but suffered a setback after doubling up Petleshkov. Both players flopped top pair but Petleshkov held the bigger-kicker. That didn't stop Shcherbak's game plan as he continued to bully Petleshkov out of many pots. Once Shcherbak took back the lead, he cruised into the final hand of the tournament where he held against Petleshkov's . When Shcherbak turned a set of sevens, the match was all but over. The first-place finish not only gives Shcherbak his first WSOP gold bracelet, but it is also his first ever WSOP tournament cash. Shcherbak was not available for comment after capturing the title but did mention that he is a poker professional. Before this event, Shcherbak had just one recorded cash, coming from earlier this summer at the PokerStars National Championship in Barcelona. The first event of the series attracted a total of 561 entries over the course of three starting days which put together a prizepool of €538,280. There were 85 places paid and after three players busted on the money bubble, they shared a min-cash worth €1,061 each. 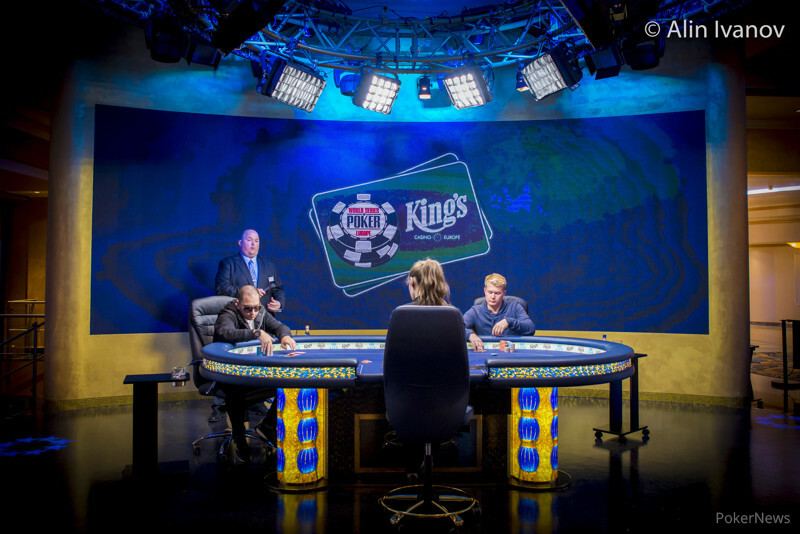 The official final table of nine finally assembled on the feature table after nearly three hours were played prior. There were many players that came to the final table with under 20 big blinds, Ali Sameeian being one of them. He moved all-in with pocket fours but ran into the pocket kings of Shcherbak and became the first casualty. Not long after, Ismael Bojang walked into a cooler with ace-king vs Treccarichi's pocket aces. Bojang was unable to come from behind and exited in eighth place. 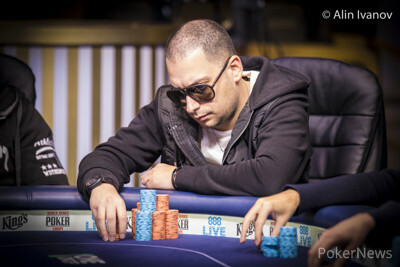 Serge Danis sat on the short stack for a long time and managed to ladder his way up to seventh place. He eventually fell victim to the blinds and left the table just six-handed. Peter Bstieler made an impressive run at the final table but with the action folded to Shcherbak in the small blind holding pocket nines, Bstieler was in trouble with pocket sevens. There was a seven on the flop to give Bstieler the lead, but a nine on the river changed his fortune as he was eliminated in sixth place. Walter Treccarichi was left on the next shortest stack and flipped for stacks against Shcherbak. Treccarichi was in the lead until Shcherbak hit a pair of queens on the river to be ousted in fifth place. Carlo Savinelli showed the most aggression on the final table but eventually, his opponents started to pick up on that. Savinelli got his chips in the middle in a dominated position against Petleshkov and could not come from behind to finish in fourth place. Three-handed play lasted the longest as the remaining trio tossed chips back and forth. Sergio Fernandez came to the final table with the chip lead but unfortunately ran a three-barrel bluff into the full house of Shcherbak. That left him on the short stack where he moved all-in on the button holding and was called by Shcherbak with . Shcherbak hit a king on the turn and that put an end to Fernandez's tournament run. With that, Shcherbak and Petleshkov were left heads-up to fight for the bracelet. There were many notables to enter the field that fell short of making the money including Kristen Bicknell, Chris Ferguson, Phil Hellmuth, Alex Foxen, Kenny Hallaert, and Roberto Romanello. There were also those that made it into Day 2 and were able to stop by the payout desk. Valentin Vornicu (14th place - $4,726), Ryan Hughes (21st place - $3,184), Scott Stewart (26th place - $3,184), Jan Bendik (29th place - €2,697), Maxim Lykov (32nd place - €2,697), Sander van Wessemael (47th place - €2,065), Allen Kessler (€2,065), James Akenhead (57th place - €1,868), Mike Leah (62nd place - €1,868), and Ryan Hefter (67th place - €1,730) all cashed in this opening event. By cashing in the first event of the series, Ryan Hughes took advantage of his fellow Player of the Year contenders coming up short. Hughes jumped into the lead of the race that everyone has their eyes on. He now holds a small lead over Chris Ferguson, although any min-cash could change things again. That wraps up Event #1 at the WSOP Europe inside the King's Casino but continue to follow along with PokerNews for continuous coverage throughout the series. Viliyan Petleshkov raised to 260,000 on the button with and Oleksandr Shcherbak three-bet to 800,000 with . Petleshkov moved all-in for 4,115,000 and Shcherbak asked for a count before making the call. The flop came and Shcherbak was still in the lead with a pair of sevens. The turn was the giving Shcherbak a set of sevens and Petleshkov was drawing dead to the on the river. Viliyan Petleshkov was eliminated in second place but will still take home a healthy €72,747 for his efforts today. Hand #97: Oleksandr Shcherbak completed with and Viliyan Petleshkov checked. The flop came [5cc4s3s], Petleshkov check-folded when Shcherbak bet 120,000. Hand #98: Petleshkov raised to 250,000 with and Shcherbak folded. Hand #99: Shcherbak raised to 240,000 with and Petleshkov called with . The flop came , Petleshkov check-called on the 240,000 bet of Shcherbak. The turn brought them the , Petleshkov checked again. Now Shcherbak bet 650,000, Petleshkov folded. Hand #100: Petleshkov limped in with Shcherbak raised to 400,000 with and Petleshkov now folded. Hand #101: Shcherbak completed with and Petleshkov checked with his . the flop came , Petleshkov check- called the 120,000 bet of Shcherbak. The turn gave them the , Petleshkov checked again, Shcherbak bet 360,000 and Petleshkov called. The on the river completed the board and Petleshkov checked. Shcherbak bet 360,000 and Petleshkov shoved all in. Shcherbak snap-folded. The players have gone for a 15-minute break. Hand #91: Viliyan Petleshkov raised to 250,000 with and Oleksandr Shcherbak three-bet to 800,000 with . Petleshkov was forced to lay his hand down. Hand #92: Shcherbak raised to 200,000 with and Petleshkov re-raised to 650,000 with , getting Shcherbak to fold. Hand #93: Petleshkov raised to 250,000 with and Shcherbak called with . The flop came and Shcherbak checked to Petleshkov who fired 350,000 with a straight flush draw. Shcherbak folded and Petleshkov won the pot. Hand #94: Shcherbak raised to 200,000 with and Petleshkov folded. Hand #95: Petleshkov raised to 250,000 with and Shcherbak called with . The flop came and both players checked to the on the turn. Two more checks and the landed on the river. Again, both players checked and Shcherbak's ace-high won the hand. Hand #96: Shcherbak raised to 250,000 with and Petleshkov called with . The flop fell and Petleshov checked to Shcherbak who fired 150,000. Petleshkov check-raised to 525,000 and Shcherbak called. The landed on the turn and both players checked to the on the river. They both checked again and Shcherbak won the hand with the only pair. Hand #86: Oleksandr Shcherbak raised to 200,000 with and Viliyan Petleshkov called with . The flop came , Petleshkov bet 150,000 and was called. They both checked on the on the turn. The river completed the board with the , Petleshkov check-raised to 975,000 on the 250,000 bet of Shcherbak. Shcherbak then re-raised to 2,200,000 and now Petleshkov folded. Hand #87: Petleshkov raised with pocket tens and Shcherbak folded. Hand #88: Shcherbak raised to 200,000 with and Petleshkov called with . The flop brought them the on which they both checked. The turn gave them the , Petleshkov check-folded to the 200,000 bet of Shcherbak. Hand #89: Petleshkov completed with and Shcherbak checked with the in his hand. They checked through the board which was [ . Hand #90: Shcherbak raised to 200,000 and Petleshkov re-raised with to 650,000. Shcherbak folded. Hand #81: Viliyan Petleshkov limped the button with and Oleksandr Shcherbak checked his big blind with . The flop came and Shcherbak won the pot with a bet of 100,000. Hand #82: Shcherbak raised to 200,000 with and Petleshkov re-raised to 650,000 with . Shcherbak folded and Petleshkov won the hand. Hand #83: Shcherbak picked up a walk in the big blind. Hand #84: Petleshkov received a walk. Hand #85: In a limped pot, the flop came . 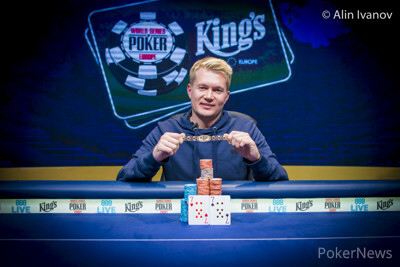 Petleshkov held and took down the pot with a bet of 125,000. Hand #76: Oleksandr Shcherback compelted, Viliyan Petleshkov checked. Flop came and Shcherbak won the pot with a bet. Hand #77: Petleshkov raised to 250,000 with Shcherbak called with . The flop came , Shcherbak check-folded on the 225,000 bet of Petleshkov. Hand #78: Shcherbak raised to 200,000 with and Petleshkov re-raised to 600,000 with . Shcherbak called. The flop came , Petleshkov bet 775,000 and Shcherbak raised all-in. Petleshkov called. The cards were turned over. The turn brought them the and the on the river completed the board to give Petleshkov the double up. Hand #79: Petleshkov completed with , Shcherbak checked with . The flop came on which they both checked. The turn was the Shcherbak bet 100,000 and Petleshkov raised to 425,000 and Shcherbak folded. Hand #80: Shcherbak completed with , Petleshkov checked with . The flop came which they checked on, the on the turn was also checked through. The river completed the board with the , Petleshkov check-folded on the 600,000 bet of Shcherbak.